This book charts the vicissitudes of a rural community of papermakers in Sichuan. The process of transforming bamboo into paper involves production-related and social skills, as well as the everyday skills that allowed these papermakers to survive in an era of tumultuous change. 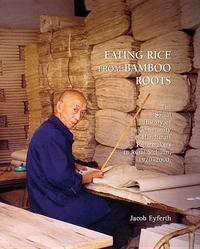 The Chinese revolution--understood as a series of interconnected political, social, and technological transformations--was, Jacob Eyferth argues, as much about the redistribution of skill, knowledge, and technical control as it was about the redistribution of land and political power. The larger context for this study is the "rural-urban divide" the institutional, social, and economic cleavages that separate rural people from urbanites. This book traces the changes in the distribution of knowledge that led to a massive transfer of technical control from villages to cities, from primary producers to managerial elites, and from women to men. It asks how a vision of rural people as unskilled has affected their place in the body politic and contributed to their disenfranchisement. By viewing skill as a contested resource, subject to distribution struggles, it addresses the issue of how revolution, state-making, and marketization have changed rural China.